Frequently asked questions at UrgentHomeworkHelp.com answered. If you do not find your question here, drop us an email to info@urgenthomeworkhelp.com. Happy to help. These questions are frequently asked by many of our customers. While we have tried to cover as many of them as possible, it is possible we might have inadvertently missed out some frequently asked question. Please feel free to bring it to our notice so that we an take steps get it quickly updated on this page. Ans: Simple. Get in touch with us. Let us know your requirements - subject & topic, length of the paper/dissertation, referencing style, when you want it delivered and then make the payment on our website. You will get an email receipt for your payment and a confirmation of your delivery date. That's it. Collect your 100% completed, plagiarism free assignment on the confirmed delivery date. Q2. How many times can I ask for revisions (corrections)? Ans: Any number of times until you are satisfied with our work. Your satisfaction is our ultimate goal. Having said that, our writers usually proceed with writing the assignment exactly as per the requirements provided by you during the initial discussion, so if it is a miss from our side, you can ask us to revise it any number of times. And we'll do it for free. But, if it is a request for new features/details to be added or changed, then it will be considered a change request which will be chargeable to you. 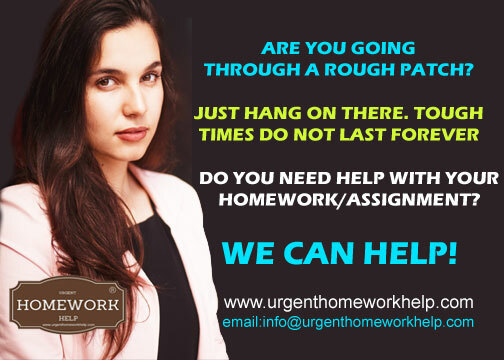 LET US SEND YOU AN INSTANT FREE QUOTE FOR COLLEGE HOMEWORK HELP. CLICK HERE NOW. Q3. Do you really provide 100% urgent (overnight/express) services? Ans: Yes we do. We call it 24 hour homework help. Once we confirm delivery, you can rest assured that it will be delivered on that date at any cost. We never accept work that we cannot complete on time. Q4. How can I pay for my assignments? Ans: You can pay by any credit or debit card. You can also pay by PayPal. After you have made a payment to us, we will send you an email confirming receipt of your payment. Q5. How can I contact you? Ans: You can contact us by chat, email, Skype, Google Hangouts & telephone. We work 24/7 and our customer success managers are available on chat all days of the week, including wekends and holidays. Please check our Contact Page for more details. Q6. I don't live in Australia, Canada, UK or US. Will you still write my assignments? Ans: Absolutely! Where you live doesn't matter as long as you are able to connect to the internet and send and receive emails from us. All you need to do is to send in your requirement and make payment on our website. We will deliver the fully completed assignment on the confirmed delivery date. Q7. Do you guys only write assignments? You got a topic? We have an expert writer for you! CLICK HERE FOR AN INSTANT FREE QUOTE FROM OUR TOP ONLINE ASSIGNMENT EXPERTS. Q8. Is my information safe with you? Ans: Absolutely! We NEVER EVER share, sell or publish your personal, academic or financial information to anyone under any circumstances, except of course, if it is a request from a government law enforcement agency. We TOTALLY respect your privacy. Q9. Do you actually work 24x7x365? Ans: Yes. We have multiple facilities around the world and multiple teams working from these places. Our writers also work for us from different countries. So, at any time of the day or night, you will be able to get in touch with us through telephone, email or chat. Yes, we work on Sundays too! We want you to know that we treat your information with the highest levels of confidentiality. Your personal, academic or financial details are NEVER shared with anyone. For every payment you make, you will get an email receipt confirming the payment that you had made, along with your order number for that assignment. Should you need any help, you can always get in touch with us through email or 24x7 Chat. We are available for you round the clock, all through the year.